In the nineteen-eighties, and once autonomy had been won back, the Generalitat de Catalunya (Catalan government) promoted a School Construction Plan aimed at providing new teaching centres for those towns that did not have them or which due to demographic growth needed new facilities to meet the demand for schooling. These centres had to fulfil a twofold objective: to favour the new educational guidelines promoted by the government and to be architecturally functional and innovative. 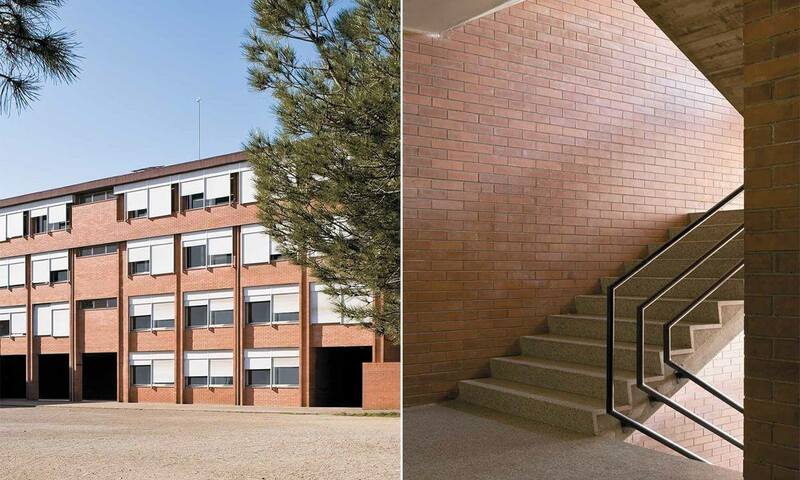 In accordance with this policy, the Education Department entrusted Josep Ribas and his colleagues, J. Anglada and D. Gelabert, to build a sixth-form college, which currently houses the Joan Oliver secondary school, in the Sant Julià district, in the north of Sabadell. This building occupies a third of the triangular site made up of Avinguda Francesc Trabal, Carrer Mercè Rodoreda and Carrer Armand Obiols, with which it is in line and by which it is entered. Despite the desired simplicity of the building, we find a series of details that personalise it and point out the skill of its authors, such as the spreading out of some closures of the façade, the play of windows and transoms, on leaving the pillars open to view or concealed, the types of blinds chosen, the sloping porch or the gabled roof, as an evocation of traditional architecture.